PATNA: Crisis has gripped yet another Grand Alliance partner, the Rashtriya Lok Samata Party (RLSP) with a top leader Nagmani found singing paeans to Bihar chief minister Nitish Kumar, once his bitter enemy. RLSP is headed by former union minister Upendra Kushwaha. Nagmani who was serving as executive national president was found heaping praises on the chief minister at a function organised on Friday to mark unveiling of the new statue of socialist leader Jagdeo Prasad in Patna. Finding the matter serious, the RLSP has now removed Nagmani from his post and suspended him from the primary membership of the party. He has been asked him send his clarification within three days. “Sri Nagmani, Executive National President of @RLSPIndia has been found involved in anti party activity. He has been removed from his post with immediate effect and asked to justify within 3 days as why should he not be suspended from its primary membership,” the RLSP tweeted with be show-cause notice served on the leader. Nagmani had been maintaining low profile since the RLSP joined the Grand Alliance and was not seen joining the RLSP’s agitation programme for reforms in education system. 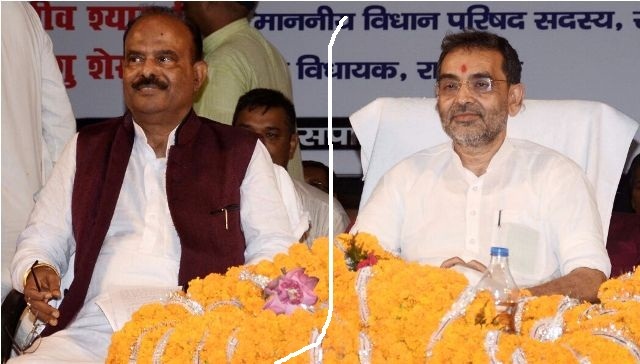 Two other RLSP legislators have already revolted against the party leadership and are said to be in touch with the NDA while Kushwaha has quit the ruling national alliance. RLSP is the second Grand Alliance partner which has come under crisis. Earlier this week, two senior leaders from Hindustani Awam Morcha (HAM) led by Jitan Ram Manjhi resigned over intra-party conflicts. Brishen Patel who resigned as HAM’s state president said there was no point in staying with the party when the top leaders were airing divergent views in public. “While Manjhi praised Rahul Gandhi and his rally, his national spokesman termed the Congress rally as super flop. This is strange,” Patel said.